Don't think of blogging as outdated or old-fashioned, because this isn't the case - especially for SaaS companies. Frankly, business blogging is more relevant than ever. Inbound along with content marketing efforts are proving to be crucial for growing sales for companies in various industries. There's a reason HubSpot, who's leading the pack in content marketing for SaaS companies, says that inbound marketing begins with blogging: "It's the single best way to attract new visitors to your website and convert leads." Wondering how can you get started with your SaaS blogging efforts? 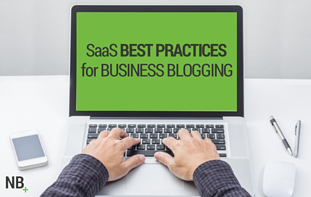 Let's review SaaS best practices for business blogging. Inbound marketing is a long-term process focused on converting leads down a specific path. However, not every potential lead is the same and therefore not every lead should be treated the same. This is where blogging for multiple buyer personas comes in. The key to appealing to each persona is to recognize common challenges or pain points they face that you can solve. In other words, make each blog about your customers from the very first sentence; demonstrate that you understand what they struggle with and focus on how you can add value to their business, rather than trying selling your product. After all, executives don't care about what you're selling so much as they care about how it will impact their company, growth and revenue. So, no matter what persona you're writing for, get to the point quickly and appeal to the customer's needs to pique interest and keep them reading. This is especially crucial for SaaS companies because the product you are selling is fundamentally different from that of a physical offering. You don't want to waste time focusing on customers who will only subscribe to your offering for a few months; you want customers who will benefit from your software in the long term. The initial drafting process should only take a couple of days (if that) depending on the length and depth of the post. From there, give yourself and your team the same time for proofing. Optimally, proofing should be done by multiple parties as a fresh pair of eyes is more likely to spot errors than the author of the post. If major revisions are required, allow another couple of days for further drafting and proofing. Once the post is cleaned up and on-message, it's ready for publication. Blogging should be an essential part of any SaaS company's marketing efforts because both SaaS and blogging are about developing a long-term relationship. By keeping this in mind, as well as the tips outlined in this post, you will be able to create an effective blog for your company that generates interest, increases sales and keeps customers coming back for more. Do you have any advice on blogging you'd like to share? Comment below!